There are three “standard” necktie knots, Four-In-Hand, Windsor, Half Windsor and one “not so” standard, The Pratt or Shelby. Also below, how to tie a Bow tie and an Ascot. Four-in-Hand – In the 1890’s the term originally referred to a coach drawn by four horses in two teams driven in tandem by a single person. It was considered great sport by the young men of the day and they organized into clubs. Also adopted the way professional coachmen knotted their ties with two long trailing ends like the reins. A similar French yachting knot is known as a “regate”. 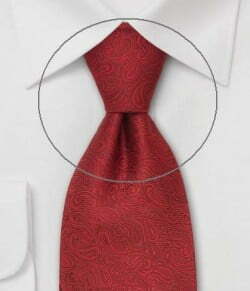 The knot is small for most shirt collar styles, but requires some work at the end to keep it from looking crooked. Start with wide end of the tie on your right and extending a foot below narrow end. Cross wide end over narrow, and back underneath. Continue around, passing wide end across front of narrow once more. Pass wide end up through loop. Holding front of knot loose with index finger pass wide end down through loop in front. Remove finger and tighten knot carefully. Draw up tight to collar by holding narrow end and sliding knot up snug. Remove finger and tighten knot carefully creating a dimple just under the knot. Windsor– introduced, but probably not invented by the Duke of Windsor, abdicated King Edward VIII who wore the knot when he was Prince of Wales. A wide knot but square, which is perfect for spread shirt collar styles. Tighten creating a dimple just under the knot. Half Windsor – a smaller version of the full Windsor. Ignore step #4 in the Windsor knot so that you only make one of the two side loops. Start with wide end of tie on your right and extending a foot below narrow end. Cross wide end over narrow and turn back underneath. Bring up and turn down through loop. Pass wide end around front from left to right. And down through knot in front. Tighten carefully and draw up to collar creating a dimple just under the knot. Pratt or Shelby — introduced in August of 1989 it was reportedly invented by Jerry Pratt who worked for the US Chamber of Commerce, but made famous by Minneapolis news anchor Don Shelby. A 92-year-old viewer disgruntled with Shelby’s atrocious on-air tie knots showed him how to tie the new knot. Even if you have tied the most perfect knot in the history of the world, if it doesn’t have a perfect dimple just under the knot it ain’t perfect! Sophisticated men and women notice a tie knot’s dimple. How to get one? Place your index finger in the middle of the tie just under where the knot is forming, pinch that part of the necktie between your thumb and middle finger and squeeze together as you pull it down and tighten the knot. The necktie knot should hide the collar button. ANDY’S ADVICE: Ties should end within the area of the belt buckle (not above and not below). Even if you’re wearing braces!So how can you tie your knot so that the front falls to your belt buckle, since all tie lengths may be different? The secret is that the knot is constant! So the solution is to tie your regular tie knot, then carefully untie it so that you can measure the length of tie material that makes up the knot. My knot happens to be the exact length between the small finger and thumb of my right hand fully stretched out. This is handy for me since I don’t have to take a measuring stick when I travel. To get the front end of the tie to fall within the range of your belt buckle just add your knot length measurement to the length of the long part of your tie, below your belt buckle. So when you start to tie your tie, the wide end will be hanging below your belt buckle, the exact length of your knot! The Onassis — This is how the Greek shipping VIP tied his knot in the late 1950’s and it was also popular for a few minutes in the 1960’s with white belts and shoes, this is another variation of the four-in-hand except that the wide end goes over the knot, hides it and hangs from the top. Remember the motion is similar to tying your shoelaces! Start with end in left hand extending 1½” below that in right hand. Cross longer end over shorter and pass up through loop. Remember the motion is similar to tying your shoelaces! Form front loop of bow by doubling up short end (hanging) and placing across collar points. Hold this front loop with thumb and forefinger of left hand. Drop long end down over front. Poke resulting loop through knot behind front loop (see illustration). Even ends and tighten by pulling on the loops. Start with the right end extending 6” before the left end. If part of morning coat attire, the ascot is worn outside the shirt, but you can use a stick pin to keep it together.